As we leave the MPs’ resource centre in Portcullis House, one backbencher comes up to David Lammy and tells him to “keep up the good work”. 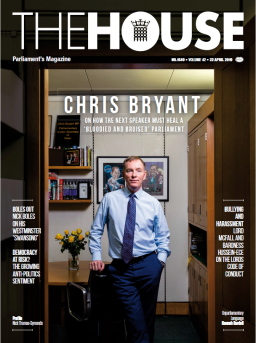 The Tottenham MP has never enjoyed a higher profile since first entering Parliament in 2000, mainly for his work over the past 12 months on the Grenfell tragedy and Windrush. He admits, however, to being somewhat perplexed by the status which has been bestowed upon him. “I am genuinely bemused that so many people describe me as passionate because I think that’s not really about me, I think that’s about the political class,” he says. “There’s a shitload to be passionate about. For Lammy, Grenfell is personal. His friend Khadija Saye, a 24-year-old artist, was among the 72 who perished in the devastating blaze. He says: “I’ve always been absolutely clear. I don’t pretend to have a sober neutrality on the subject of Grenfell. “I lost a friend, my friend lost a mentee and an intern that she’d known for many years and watched flourish and she died at the beginning of what looked like a fantastic career as an artist that we had nourished, alongside her mother. The parallels with the Windrush scandal and Grenfell are clear, says Lammy, who has done more than most to pressure the Government on the plight of Caribbean immigrants who came to the UK decades ago and yet were forced to prove their right to residency. Both issues held up a mirror to how British society treats minorities, and the reflection was far from flattering. He says: “The thing that I know, coming from working class stock, is that we believe people who wear uniforms and have posh voices when they tell you to stay put. The people that died were the people that stayed put. “So many of these folk lacked an agency. We’ve forgotten that if you’re in a tower block estate on the 22nd floor your life is entirely in the hands of the state to get you out in the event of a fire. There are a lot of people who don’t understand what it means to be on the 22nd floor without sprinklers or two different fire escapes. Grenfell brought back to the public as a whole a story about social housing, about how many normal people live, that you don’t see on television. Lammy says that if he was being generous, he would attribute the Government’s sub-optimal response to Grenfell to the amount of attention it is having to devote to removing Britain from the European Union. But he suspects that the truth of the matter is that Theresa May is leading an administration which is “lacking in humanity”. “There’s gross incompetence and, it would seem, indifference,” he says. “This feels like a very frozen government. “When Theresa May became Prime Minister she delivered a very effective, one nation speech on the steps of Number 10 that for a moment left Labour colleagues slightly nervous that a lot of the ground had been taken and, if she was going to govern like that, we would be out of power for a very long time indeed. Lammy remains in no doubt that those who died in Grenfell Tower are the victims of “corporate manslaughter”, and says the Metropolitan Police must do more to update the public on how their criminal investigation into the fire is going. “My view is that we need to see people on trial and I look forward to going to the Old Bailey and seeing those individuals on trial,” he says. Lammy also refuses to resile from the view he expressed shortly after the blaze that the true number of victims may have been covered up by the authorities. “I was very keen, and still am, to speak up for those that lived in the Lancaster West estate and lived in Grenfell Tower,” he says. “They knew their neighbours, they got into the lift with them, they knew them for many years, and they felt the figures that were emerging did not represent the numbers they knew were involved. Lammy is clear that a fitting tribute to the Grenfell victims would be a system which guarantees that a similar tragedy can never happen again. Until that happens, David Lammy will continue to speak up. Passionately.